Edited: This giveaway is now closed- congratulations to the winner, Erik Deckers! Thanks for playing! The pools are open, summer reading programs are about to begin, movies and concerts in the park are all scheduled up, and the Tribe is playing ball at Victory Field. I love Indiana summer nights. I love being outside, whether it’s at a park, at a concert or in my own backyard. There’s just something about a summer night that holds so much more possibility than a night in, say, February. One of the best ways to spend a summer night downtown is to take a game in a Victory Field. The Indianapolis Indians are the home team, and the game is fun time for everyone, baseball fans and casual observers alike. 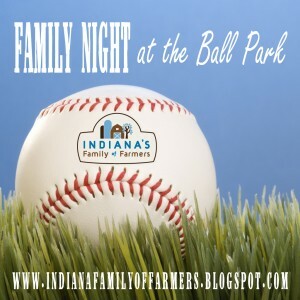 This year, once again, Indiana’s Family of Farmers would like to send you (yes, you) and up to seven other people to their annual night at the ballpark, happening on June 11, 2012. How cool is that? All you have to do is leave a comment here, telling me what you like to do outside on a nice summer’s night. For additional chances to win, feel free to do any of the following. Be sure to leave a seperate, additional comment for each action you take. 2) Post about this promotion on Facebook with a link to this post. 3) Like Family Fun in the City on Facebook (what? like another blog? Yes. Please do. We’ll be posting amazing things there all summer long.). Remember, leave a separate comment for each thing you do- each comment will count as it’s own entry. The giveaway will run through Friday, June 1st at 9pm. The winner will have 24 hrs to get back to me, so be sure to use your best email when you fill out the comment form. Good luck! Disclosure: Thanks for Indiana Family of Farmers for providing my family with tickets to this super fun night! While they provided the tickets for my family and this giveaway, the fun we have a Victory Field (and my opinion of it) is all our own! When we bought our house, I made sure we had a west-facing house, instead of an east- or south-facing, because I like hanging out in my garage. The garage is like a 3-seasons porch, and I have tricked it out appropriately, with a giant workbench, and plenty of stuff for people to do. On a spring, summer, or fall night, I hook my computer up to the stereo and turn on my favorite Internet radio station. Then my wife and I sit in the shade in the driveway while the kids ride their bikes up and down the street. It’s just quiet family time together where we can catch up on the events of the day, and the kids can be outside instead of inside in front of the TV. I like to take evening cruises with my windows rolled down, to small towns I’ve never been too. I’ll take my camera to capture some of that towns history. And while I’m there, if I spot a locally owned ice cream place, I’ll get a chocolate milkshake. I like to sit outside while my husband grills and drink a margarita. Nice way to relax after corralling three children all day. We love to catch lightning bugs or hang out and listen to concerts on the canal. We love to spend our summer evenings hanging out by the water. Go find a lake with a beach or outdoor restaurant and enjoy the water. And I liked Family Fun in the City on Facebook.